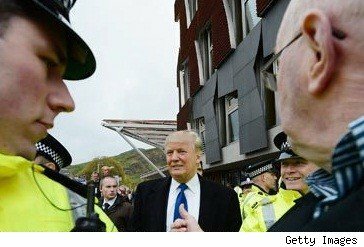 EDINBURGH, Scotland -- He came, he saw, he blustered. Donald Trump on Wednesday swept into Scotland's parliament to demand the country end plans for an offshore wind farm that he fears will spoil the view at his exclusive new $750 million pound ($1.2 billion) golf resort. In a typically blunt display, the New York property tycoon told an inquiry into renewable energy to stop the wind power efforts in the country's north. Members of the committee are looking at how achievable the Scottish government's green targets for 2020 are. The plans for 11 200-foot (60-meter) tall wind turbines are part of the government's goal of positioning itself as a leader in renewable energy. Trump (pictured at left as he left Parliament) claimed that Scotland's leader, Alex Salmond, and his predecessor, Jack McConnell, gave him verbal assurances that a wind farm would not be built off the coast of his resort. "They wanted my money," Trump said. "I was lured into buying the site, after I had spent my money they came and announced the plan. At the time I bought the land I felt confident the wind farm was not going to happen." The inquiry heard that Trump paid 4.5 million pounds for the majority of the land eight miles north of Aberdeen in January 2006. The resort is due to open on July 10. There was an irony to Trump's complaints: When Salmond backed Trump's plans for the result, the head of the Scottish government was hailed a "great man" by the tycoon. But Trump turned on Salmond over plans to put the wind turbine farm off the coast and within view of the golf course. Trump claims that the turbines will ruin the environment and will be bad for tourism. The course was built on sand dunes, despite protests from locals and environmentalists. 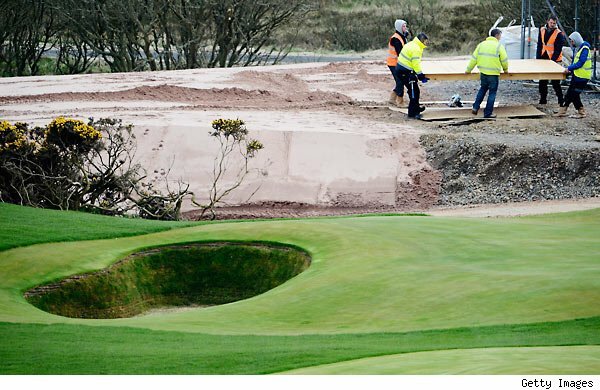 The dunes, which were home to rare wading birds, were bulldozed to make way for the fairways in 2009 and 2010. Scotland's tourism agency said its own research shows that 83 percent of visitors to Britain will not be turned off by turbines. "We are both reassured and encouraged by the findings of our survey which suggest that, at the current time, the overwhelming majority of consumers do not feel wind farms spoil the look of the countryside," said VisitScotland chief Malcolm Roughead.